Valley Web Solutions is run by a team of professional internet marketeers who already run their own highly ranking and profitable internet sites across all sectors from retail to finance. The company consists of a number of specialised SEO professionals assisted by a highly talented team of content writers, link builders, developers and account managers who have previously worked in many prestigious media companies and online businesses. We use our own advanced knowledge of search engine optimisation techniques learned from our own ventures to assist a select number of clients in various sectors to improve their own search engine ranking positions and ultimately revenue gained from the natural search channel. We can work with any type of website to help you to improve your positions across all of the major search engines. Due to our commitment and ethical stance we only work with one client in each specialised sector to ensure we deliver the results required and to avoid any conflict of interest. Our clients come to us by recommendation primarily and unlike other search engine optimisation companies we have no need for an outward bound sales team. Further more we only work within the search engine optimisation business as not to dilute our resources and to focus on our clients continued ranking improvements within the constantly changing search environment. After an initial consultation to define your key objectives and requirements we will perform an analysis of your current site and it's ranking compared to your competitors based on keywords you supply to us or we suggest for you. 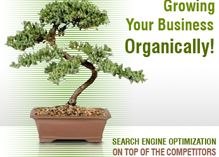 A bespoke package for an SEO solution will then be tailor made for you based on both on page and off page SEO factors. You will be provided with a dedicated Account Manager to assist you through the process at all times and will be given frequent reports to update you as to your sites progress and works completed. All of our techniques are legitimate and adhere to standard guidelines provided by the search engines themselves. As we believe SEO solutions cannot be "packaged" into a set number of article submissions,bookmarks or links we tailor make individual programs for all of our clients based on our knowledge and previous results obtained from similar sites worked on. No two are ever the same just as no two business's are ever. In fact we our so confident of our abilities we can even work on a pay per performance model meaning that you only pay us when a a certain number of keywords rank .